ARP Speed Studs UNIVERSAL - Pann Auto Performance - San Diego largest aftermarket automotive performance parts - What do you drive? Because races can be won or lost in the pits, the engineers at ARP set about to create the ultimate oval track competition wheel stud that facilitates accurate wheel positioning and quicker release/tightening of lug nuts. ARP’s new “Speed Studs” (and companion “Speed Nuts”) are so good that a large number of NASCAR teams in Sprint Cup, Nationwide and Camping World Truck Series use them exclusively. They’re made from heat-treated 200,000 psi chrome moly steel and feature precision J-form threads (formed after heat-treat for improved fatigue strength), exclusive nut-starter and bullet shape radius that all but eliminates cross-threading, shot-peening, special baked-on dry film lubricant (reduces possibility of galling and assures consistent clamp loads), and double magnaflux inspection. A new head design is employed that fits the registers of all popular hubs without grinding, and studs are available in 31 underhead lengths to provide you with the optimum thread engagement for your particular setup. The finest studs available! Designed for professional racing environments where split second improvements in pit stop times can make the winning difference, and “unbustable” reliability is an absolute must. 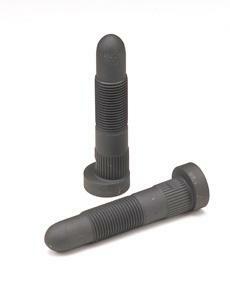 ARP’s Speed Nuts feature a profiled nut face for easy installation, quicker socket releases and resistance to jamming. They’re made from premium heat-treated chrome moly that’s nominally rated at 200,000 psi tensile strength, shot-peened to remove stress risers and double magnafluxed after heat-treating and thread-forming to assure 100% metallurgical integrity. Coated with Alumotef III gold coating. Speed Nuts are ready for “instant” use (thread chasing not required).